The Tank Destroyer force was created as a mobile GHQ antitank reserve in 1941. The original concept called for battalions to be concentrated in tank destroyer brigades and groups for employment en masse against an armored threat. In practice, the realities of combat and the erosion of the German Panzer force meant that the tank destroyers were usually attached individually to divisions. Initial War Department plans called for the creation of 220 TD Battalions, a figure that was never achieved. By the end of 1943, 106 battalions were in existence of which 56 served in Europe or Italy and 6 in the Pacific. 11 of the remaining battalions were converted to armored field artillery, amphibious tractor, chemical mortar, or tank battalions. 63 battalions were disbanded -- with their personnel going to the replacement pool. The first TD Battalions organized were fully self-propelled. However, combat experience in North Africa appeared to show that towed guns would be desirable. As a result, about one-half of the battalions were converted to towed in 1943. Unfortunately, further experience proved that towed guns were simply too immobile, making them highly vulnerable. As a result, in 1944 many of the towed battalions were converted back to self-propelled. On 1 January 1945, a total of 73 battalions were active. The tank destroyer battalions were all organized with 3 companies, each company was equipped with 12 guns, for a total of 36 in the battalion. The early Battalions also had an anti-aircraft and an engineer platoon which were later discarded. A strong reconnaissance element was retained, equivalent to a mechanized cavalry troop. 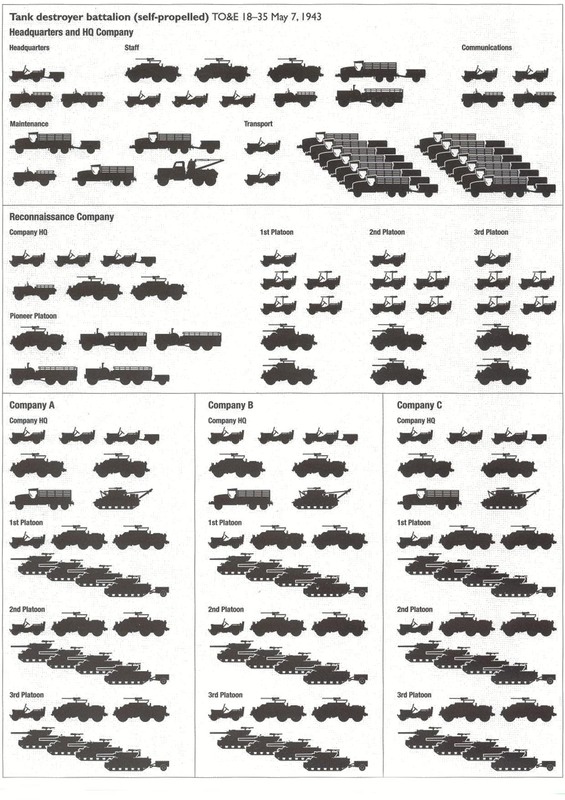 "Tank Destroyer Battalion Equipment chart"
The TD battalions first employed two stopgap ad hoc weapons, the M3 halftrack, which mounted an elderly 75mm gun and the M6 TD, a Dodge 3/4 ton Weapons Carrier with a 37mm AT gun crudely mounted in the truck bed. Later, in North Africa in 1943, the TD battalions began to receive the first standardized TD gun, the M10. The M10 was based on a variant of the M4 tank chassis, was lightly armored, and had poor cross-country mobility and speed. However, its 3" gun, a development of the prewar AA gun, was quite powerful for the time. By early 1944 the first purpose-designed TD appeared, the M18, and began to slowly replace the M10. 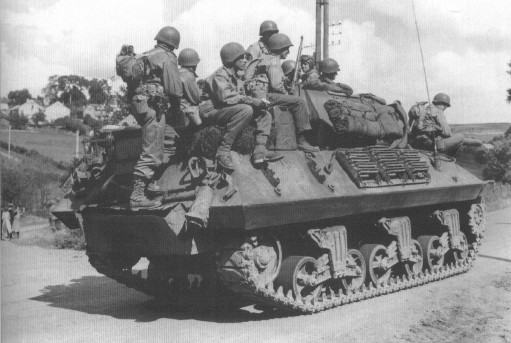 The M18 was more lightly armored than the M10, but had very good cross-country mobility and impressive speed. Furthermore, the gun was an improved 3", known as the 76mm, with a more powerful cartridge case and muzzle-break, giving it greater accuracy and hitting power. Finally, also in 1944, the M36 was deployed. The M36 utilized the same chassis as the M10, but mounted the powerful 90mm gun (also originally an AA weapon). The M36 was the most powerful antitank weapon in the U.S. arsenal, with the newly developed high-velocity armor piercing rounds (HVAP, also known as APCR for Armor Piercing Composite Rigid), the 90mm was easily capable of defeating all German armor, if it could get the first hit. The 601st TD Battalion first saw combat in North Africa and later on Sicily and in Italy. During the campaign in France, it was attached to the 3rd Infantry Division, which took part in the landings in southern France in August 1944, equipped with the M10 3in. GMC. It served with the division until the end of the war and was the longest-serving tank destroyer battalion of the US Army in World War II. It was completely reequipped with the M36 by January 1945. 1st Infantry Division Provisional Antitank Battalion converted to 601st Tank Destroyer Battalion on 15 December 1941. Company C of the original battalion consisted mainly of Battery D, 5th Field Artillery, the only Army unit with a continuous history from the Revolutionary War. Arrived at Gourock, Scotland, on 9 April 1942. Reconnaissance Company landed at Oran, Algeria, on 8 November as part of Operation Torch, and rest of battalion arrived in December. Fought in Battle of Kasserine Pass in February 1943 and at El Guettar in March. Converted to the M10 at end of North Africa campaign. Participated in invasion landings at Salerno, Italy, on 9 September. Made third D-day assault at Anzio on 22 January 1944 and entered Rome in June. Conducted fourth assault landing in southern France on 15 August. Advanced to German border in the Vosges region. Participated in reduction of Colmar Pocket in February 1945, then converted to the M36. Battled along the Siegfried Line until crossing the Rhine on 22 March. Helped capture Nürnberg in April and ended the war occupying Hitler’s retreat at Berchtesgaden in Bavaria. Attached to: 1st Armored Division; 1st, 3d, 9th, 34th, 36th, 45th, 103d Infantry divisions. 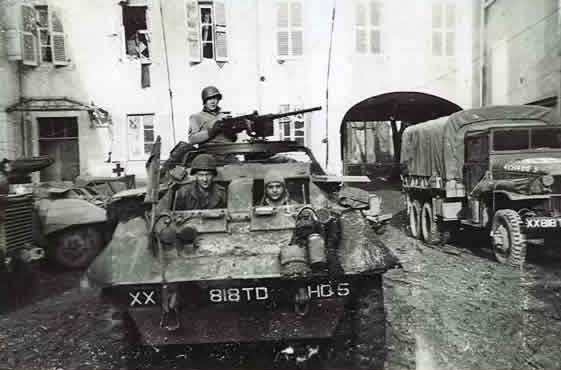 The 602nd TD Battalion, equipped with M18 76mm GMC, first deployed with the 26th Division on October 23, 1944, during the fighting in the Saar. 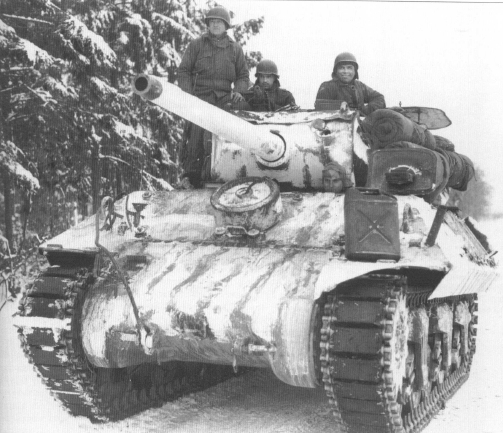 During the Battle of the Bulge, it was first deployed with the 28th Division. During the fighting on the approaches to Bastogne, and at the end of the month was shifted to the newly arrived 11th Armored Division. It remained with the 1lth Armored Division until March when it was transferred to the 89th Division, remaining with it until the end of the war. Full crew of a M18, 602nd TD BN. 2d Infantry Division Provisional Antitank Battalion converted to 602d Tank Destroyer Battalion on 15 December 1941. Equipped with M10s, then M18s before leaving the States. Arrived in Scotland on 29 July 1944 and at Omaha Beach on 26 August. Committed to battle along Moselle River on 9 September. Supported operations leading to capture of Metz, France, in November. Transferred to Belgium during Ardennes Offensive, arriving at Neufchateau on 21 December. Supported operations against the Bulge in January 1945. Fought through Siegfried Line in February. Returned to Moselle River area in March, crossed Rhine River at Boppard on 26 March. Advanced through Gotha, Eisenach, and Zwickau in April. Attached to: 17th Airborne Division; 4th and 11th Armored divisions; 26th, 28th, 80th, 87th, 89th, and 90th Infantry divisions; 2d and 6th Cavalry groups. The 603rd TD Battalion, equipped with M18 76mm GMC, first entered combat in late July with the 6th Armored Division during Operation Cobra, the breakout from Normandy. It remained with the division until the end of the war, and was the highest-scoring M18 battalion in the ETO. Activated on 15 December 1941 at Fort Lewis, Washington, from the antitank platoons of the 3d Infantry Division. Issued T70s (M18s) in October 1943, arrived at Cannock, England, on 18 April 1944. Landed at Utah Beach on 21–22 July. Committed to battle on 28 July during Cobra breakout. Advanced through Brittany to Brest and then Lorient in August, and raced east to the Moselle River sector in September. Fought east of Nancy, France, in October and supported push to the Saar River in November. Battled to Sarreguemines in December, shifted to Bastogne area to support counterattack against the Bulge. Crossed Oure River and fought through Siegfried Line in February 1945. Moved to Seventh Army sector in March, reached Rhine River at Rhine-Durkheim on 21 March. Reassigned to Third Army, crossed river at Oppenheim on 25 March. Attacked through Fulda Gap toward Erfurt in late March and April. Helped liberate Buchenwald on 11 April. Reached advance limit line at Mittweida circa 15 April. Attached to: 17th Airborne Division; 4th, 6th Armored divisions; 3d Cavalry Group. The 605th TD Battalion was equipped with towed 3in. anti-tank guns ind first deployed with the 102nd Division on February 15, 1945, in preparation or Operation Grenade, the assault over the Roer. It was transferred to the 84th division for the first week of March. During the last week of April 1944 it served with the 79th Division and 82nd Airborne Division, ending the war attached to he 82nd Airborne Division. Reorganized from the 5th Antitank Battalion (Provisional), 5th Infantry Divisions, on 16 December 1941 at Fort Custer, Michigan. Arrived at Clyde, Scotland, on 16 December 1944. Landed at Le Havre, France, on 26 January 1945 equipped with towed guns. Entered battle on 16 February near Tevern, Germany. Crossed Roer River on 24 February and joined drive to the Rhine. Deployed to Remagen bridgehead on 12 March. Withdrawn on 17 March and sent to Belgium to support British armored forces, but almost immediately attached to 17th Airborne Division. Crossed Rhine beginning 25 March at Xanten. Participated in reduction of the Ruhr Pocket in April. Crossed Elbe River on 30 April–1 May at Bleckede. Attached to: 17th, 82d Airborne divisions; 79th, 84th, 102d Infantry Division; 11th Cavalry Group; British 33d Armored Brigade. The 607th TD Battalion deployed with the 90th Division in Normandy in late June with the towed 3in. anti-tank gun and remained with the division through the end of November when it was converted to a self-propelled battalion. It was attached to the 87th Division in early February and remained with the division for most of the remainder of the campaign in Europe, ending the war equipped with M36 90mm GMC. Activated on 15 December 1941 at Fort Ord, California, from the 7th Infantry Division Provisional Antitank Battalion. Converted to a towed battalion in May 1943. Arrived at Liverpool, England, on 21 April 1944. Disembarked at Utah Beach 17–23 June. Supported advance on Cherbourg, fought along Seves River in July. Participated in drive to Le Mans and envelopment of the Falaise Pocket in August. Advanced to Moselle River in September and supported operations against Metz through November. Converted to a self-propelled battalion equipped with M36s in time for final assauLt Joined drive toward Saar River, capture of Saarlautern, and subsequent fight against Siegfried Line in December. Deployed to the Ardennes sector in January 1945. Committed against Siegfried Line again in February in the Schnee Eifel. Supported the capture of Koblenz in mid-March. Crossed the Rhine River at Boppard on 25 March. Sliced through Hessen and Thüringen during April and reached the Czechoslovak border near Plauen by mid-April. Thereafter remained in defensive positions. Attached to: 82d Airborne Division; 9th, 28th, 87th, 90th, 95th Infantry divisions; 6th Cavalry Group. Formed on December 15, 1941 at Ft. Jackson, SC as a Light Towed Battalion. Deactivated on December 20, 1943, at Camp Atterbury, IN. Personnel were transferred to other battalions, including the 607th, 610th, 643rd and the 807th. Pioneer Company 608th TD BN. The 609th TD Battalion was equipped with the M18 76mm GMC and deployed with the l0th Armored Division on October 16, 1944, remaining with the division through the war. Activated on 15 December 1941 at Fort Bragg, North Carolina. Landed at Utah Beach on 20 September 1944 equipped with M18s. Went into corps reserve beginning 28 September east of Moutier, France, where crews fired artillery missions through October. Joined operations against Siegfried Line in November and early December. Most of Company C moved to Bastogne on 18 December with 10th Armored Division; remainder of battalion fought along Sauer River. Entire battalion fought to eliminate the Bulge in January 1945. Deployed to Saar-Moselle triangle in February. Participated in capture of Trier in March. Supported attack south and east out of Mannheim bridgehead across the Rhine in late March and April and reached southern Bavaria near Füssen by the end of the month. Attached to: 101st Airborne Division; 10th Armored Division; 90th, 94th Infantry divisions. The 610th TD Battalion was converted from towed to self-propelled with the new M36 in October 1944 prior to being committed to combat. It was first deployed with the 26th Division on November 12, remaining with it for a month during the fighting in the Saar. It served with the 87th Division during the middle of December 1944, and was attached to the 4th Infantry Division from the end of January through May, except for a few days in mid-March when it supported the 42nd Division. It ended the war equipped with M36 90mm GMC. Activated on 11 April 1942 at Camp Barkeley, Texas, as a towed battalion. Arrived Greenock, Scotland, on 11 June 1944. Landed at Utah Beach on 31 July. Committed to action 10 August near Craon, France, and participated in elimination of Falaise Pocket. Raced east to the Moselle River by September. Converted to the M36 in September–October. Helped clear Maginot Line fortifications in November. Ordered to the Ardennes on 21 December. Helped eliminate the Bulge in January 1945. Battled through Siegfried Line in February near Brandscheid. Transferred back south in March. Crossed the Rhine at Worms on 29 March. Raced through central and southern Germany in April and reached the vicinity of Munich by month’s end. Ended war in Ingolstadt. Attached to: 4th, 26th, 35th, 42d, 80th, 87th Infantry divisions; 101st Cavalry Group. The 612th TD Battalion was initially deployed as a towed battalion with the 2nd Infantry Division and served with it from mid June 1944 until the end of the war. It was reequipped with the M18 76mm GMC at the end of December 1944 due to heavy losses in the Ardennes. "A" Company, 612th Tank Destroyer battalion carries troops of the 2nd Division, 9th Infantry Regiment. Activated on 25 June 1942 at Camp Swift, Texas, as a towed battalion. Arrived at Greenock, Scotland, on 15 April 1944. Landed in France beginning 14 June and committed in the vicinity of Cerisy. Fought at Vire during breakout in July and early August. Moved to Brittany and supported siege and capture of Brest in late August and September. Shifted to Belgium in October and supported operations against the Siegfried Line until December. Engaged Germans in Honsfeld, Belgium, area at outbreak of Battle of the Bulge. Converted to self-propelled battalion (M18s) beginning 29 December 1944. Joined attack through Monschau Forest in February 1945. Crossed Rhine River in March, participated in race through central Germany to Leipzig in April. Attached to: 9th Armored Division; 1st, 2d, 9th, 99th Infantry divisions. The 614th TD Battalion (Colored) was first attached to the 95th Division in late November during the fighting for the Saar, and was attached to the 103rd Division during the final few weeks of the war in Europe. It remained a towed battalion for the duration of the fighting. Activated on 25 July 1942 at Camp Carson, Colorado. Reorganized as a towed battalion in May 1943. Arrived in England on 7 September 1944, landed at Utah beachhead beginning 8 October. Deployed to Metz and supported operations against the Sigfried Line nearby in November and December. Shifted to Hagenau Forest area. Continued to support operations against Siegfried Line fortifications until late March 1945. Performed occupation duties in early April, then joined race to Innsbruck, Austria, and Brenner Pass. Attached to: 95th, 103d Infantry divisions. The 628th TD Battalion first deployed with the 5th Armored Division on August 2, 1944, during the race across France and remained with the division for most of the European campaign except for the Battle of the Bulge. The battalion was attached to the 78th Division on December 19-23, and the 82nd Airborne Division on January 2-11, 1945, retuming to the 5th Armored Division at the end of the month. It ended the war with M36 90mm GMC. Established 15 December 1941 from the 28th Infantry Division Antitank Battalion (Provisional). Arrived at Greenock, Scotland on 6 February 1944, disembarked at Utah Beach on 30 July equipped with M10s. Committed to battle on 2 August near Perier, France. Participated in envelopment of Falaise Pocket. Dashed east to the Belgian border, arriving on 2 September. Helped liberate Luxembourg, began assault on the Siegfried Line on 13 September. Conducted artillery missions in October. Converted to M36s in November, then committed to fighting in the Hürtgen Forest in December. Shifted to Aachen sector on 8 December only to be ordered to the Ardennes during the Battle of the Bulge. Fought to eliminate Bulge in January 1945. Crossed Roer River beginning 25 February and reached the Rhine on 10 March. Crossed the Rhine on 31 March at Wessel. Slashed through Germany to the Elbe River by 11 April. Attacked back west to eliminate German pockets. Took up occupation duties on 26 April near Peine. Attached to: 82d Airborne Division; 3d, 5th Armored divisions; 75th Infantry Division. Established 15 December 1941 at Fort Meade, Maryland. Arrived in Dorset, England, in January 1944 and disembarked at Omaha Beach on 2 July with M10s. Performed artillery missions in Caumont sector. Joined 30th Infantry Division in fighting at Mortain in early August, then supported reduction of the Falaise Pocket. Participated in V Corps parade through Paris on 29 August. Advanced to Luxembourg by early September and then supported operations in the Hürtgen Forest and against the Siegfried Line. Shifted to Ardennes sector on 24 December. Fought to eliminate the Bulge in January 1945. Joined renewed assault on Siegfried Line in February. Crossed Rhine River into Remagen bridgehead on 11 March and converted to the M36 that same month. Participated in operations against the Ruhr Pocket in April, then conducted road march south to Bavaria and reached the Isar River before ending offensive operations. Attached to: 82d Airborne Division; 5th Armored Division; 1st, 2d, 5th, 9th, 28th, 30th, 75th, 83d, 99th Infantry divisions. The 630th TD Battalion was a towed battalion and supported the 28th Division from July 20, 1944, until the end of the campaign, except for a few days in mid-April when elements were attached to the 97th Division. As such it was involved in some of the most intense combat of the war including the Siegfried Line campaign, the bloody Hurtgen Forest fighting, and the opening phase of the Ardennes offensive. It was reequipped with the M36 by the end of the campaign. Activated 15 December 1941 at Ft. Jackson, South Carolina. Disembarked in France from England on 24 July 1944 with towed guns and entered the line near Colombieres. Advanced across France with the 28th Infantry Division to Luxembourg. Supported operations against the Siegfried Line in September–October. Operated in the Hürtgen Forest in November. Shifted to the Ardennes sector with the 28th Infantry Division in late November, where located at start of German offensive in December. Shifted south to Colmar area in January 1945, where the 28th Infantry Division operated under French control. Returned north in mid-February only to redeploy south to the Saar region in mid-March, after which the battalion converted to the M36. Participated in the elimination of the Ruhr Pocket in April. Took up occupation duties at Zweibrücken on 28 April. Attached to: 17th Airborne Division; 13th Armored Division; 28th Infantry Division. Activated 15 December 1941 at Camp Blanding, Florida. Reorganized as a towed battalion in December 1943. Arrived at Gourock, Scotland, on 5 August 1944 and at Utah Beach on 31 August. Performed rear-area duties in France, Luxembourg, and Germany for the duration of the campaign as part of Third Army. Established 15 December 1941 at Camp Livingston, LA from personnel of the 32nd Infantry Division. Originally a Light Towed Battalion, they shipped from San Francisco, port of embarkation on May. 12, 1942 and arrived in Australia on May 12, 1942. Landed New Guinea on Oct 28, 1943. Landed Philippines on Oct. 20, 1944. The 632nd Tank Destroyer Battalion was, essentially, treated as an organic unit of the 32nd Division. It went to Australia with the 32nd Division. It fought with the 32nd at Aitape and Saidor. It went into the battle for Leyte with the 1st Cavalry Division, but later joined the 32nd on Leyte. On Luzon it was initially attached to the 13th Armored Group but subsequently served with 37th, 44th and 32nd Divisions on Luzon. Unit was deactivated at Camp Stoneman, CA on Jan. 1, 1946. Activated 16 December 1941 at Camp Forrest, Tennessee. Arrived at Le Havre, France, on 13 April 1945 equipped with M18s. Moved to Nürnberg, Germany, arriving on 3 May. Advanced to Pilsen, Czechoslovakia. Attached to 16th Armored Division. The 634th TD Battalion, equipped with M10 3in. GMC, served with the lst Infantry Division from the beginning of August 1944 until the end of the war in Europe, seeing fighting in most of the major engagements of the war including the Normandy battles and the Battle of the Bulge. Activated at Camp Claiborne, Louisiana, on 16 December 1941. Arrived in England on 10 January 1944. Landed at Utah Beach on 30 June equipped with M10s. Committed to battle on 10 July near Carentan. Participated in Cobra breakout in late July; widely separated elements helped capture Mayenne and defeat Mortain counteroffensive in early August. Raced east to Mons, Belgium. Supported operations against Siegfried Line and capture of Aachen, Germany, in October. Fought in Hürtgen Forest in November. Moved to Belgium in December, only to race south to Ardennes in late December. Crossed Roer River on 25 February 1945. Pushed to Rhine River at Bonn by 9 March. Crossed river at Remagen on 15 March and supported envelopment of the Ruhr Pocket. Drove east to Harz Mountains in early April. Drove 200 miles to Czechoslovak border by 28 April. Attached to: 1st, 4th, 83d Infantry divisions. The 635th TD Battalion was a towed battalion deployed with the ist Infantry Division in Normandy from June 7 until the end of September, and later served with the 71st Division from mid-March 1945 until the end of the war. It was one of a handful of battalions that retained the towed configuration through the campaign. Established 15 December 1941 at Camp Robertson, Arkansas, from the 35th Infantry Division Antitank Battalion (Provisional). Arrived Liverpool, England, on 9 February 1944. Landed at Omaha Beach on 8 June. Advanced through northern France and Belgium. Operated in Roetgen-Aachen sector and Hürtgen Forest during autumn. Transferred to Belgium on 22 December during Battle of the Bulge. Returned to Aachen area in January and supported drive toward Rhine River near Cologne. Transferred to Seventh Army and again almost immediately to Third Army on 1 April 1945. Crossed Rhine at Mannheim and advanced through central Germany to Austria. Supported: 1st, 71st Infantry divisions; 4th Cavalry Group. The 636th TD Battalion deployed with the 36th Division and remained with the division until the end of the war, except for some short interludes when elements of the battalion supported the 45th Division in October 1944, and the 13th Armored Division during late March and April 1945. 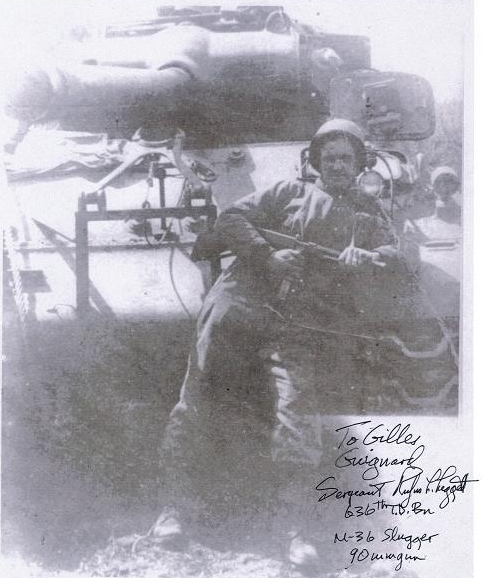 Les Legget began his military career with the Texas National Guard in 1940, eventually earning his Sergeant’s stripes as a member of the 36th Infantry Division 636th Tank Destroyer Battalion’s Reconnaissance Company. Les Leggett saw action on the beaches of Salerno, the Bernhard Line at San Pietro, the Gustav Line at the Rapido River, and Cassino, before going ashore two days after the assault at Anzio. Leggett’s platoon later stormed the beaches near Nice in Southern France in operation Dragoon. Elements of the 36th charged 300 miles through France in just 26 days, crossed the Rhine and Danube Rivers, and then fought their way into Northern Austria, where they were stationed when the war ended. Along the way Leggett was wounded by shell fragments, buzzed by a pair of German ME-109s in farm country, ran headlong into a German convoy in woods, and tumbled down a steep mountain embankment when the road gave way under his jeep. Activated on 15 December 1941 at Camp Bowie, Texas. Arrived at Oran, Algeria, on 13 April 1943. Landed at Paestum, Italy, beginning 13 September 1943. Elements performed artillery missions, guarded Fifth Army CP, and trained British troops on M10 and TD doctrine in October and November. Reentered line in Mignano sector in late November, where supported assault on San Pietro. Supported Rapido River crossing in January 1944. Entered Cassino sector in February. Transferred to Anzio beachhead in May. Entered Rome on 4 June. Landed in southern France on 15 August. First unit to enter Lyon and to reach the Moselle River in September. Engaged in the Vosges Mountain region beginning in October. Relieved 601st TD Battalion in Strasbourg in December. Battled German Northwind offensive in January and February 1945. Converted to M36 beginning late February. Struck Siegfried Line near Wissembourg in late March. Crossed Rhine with 14th Armored Division in April, dashed toward Nürnberg. Ended war in southern Bavaria near Tegernsee. Attached to: 14th Armored Division; 36th Infantry Division. Established December 19, 1941 at Camp Shelby, MS from personnel of the 37nd Infantry Division. Originally a Light Towed Battalion, they shipped from San Francisco, port of embarkation on May. 12, 1942 and arrived in Australia on May 26, 1942. Arrived Fiji Islands on June 28, 1942. Unit was attached to the 11th Airborne Div., 1st Cavalry and 37th Infantry Div. Inactivated in Japan on Jan. 25th 1946. The 638th TD Battalion, equipped with the M18 76mm GMC, deployed with the 84th Division at the beginning of December 1944, and took part in the subsequent Ardennes fighting. It remained with the division until the end of the war. Established 15 December 1941 at Camp Shelby, Mississippi. Arrived at Cherbourg, France, 7 September 1944 equipped with M18s. 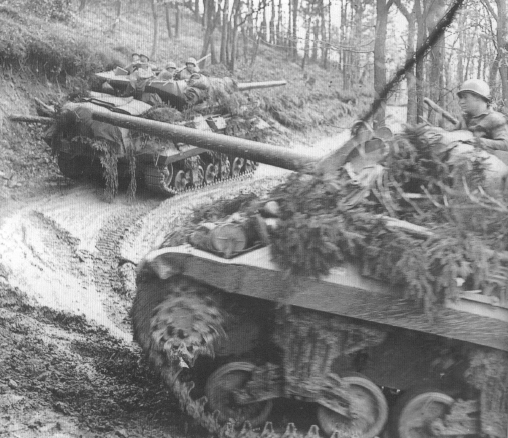 Entered the line near Prummern on 20 November and supported operations against the Siegfried Line. Shifted to the Ardennes sector around Rochefort, Belgium, on 22 December. Fought to reduce the Bulge during January 1945. Supported Roer River crossing in February. Crossed the Rhine River on 1 April. Advanced across Germany and reached the Elbe River near Wittenberg on 24 April. Attached to: 84th Infantry Division. The 643rd TD Battalion, equipped with M18 76mm GMC (March'45), first supported the 82nd Airborne Division in early January 1945 in the Ardennes and then served with the 83rd Division from the beginning of February until the end of the war. Redesignated from the 43rd Infantry Division’s Antitank Battalion (Provisional) on 3 December 1941 and activated at Camp Blanding, Florida. On 15 September Arrived at Cherbourg, France, on 15 December 1944 equipped with towed guns. First engaged near Manhay, Belgium, on 22 December 1944. Crossed the Roer River on 24 February 1945. Re-equipped with M18s in March 1945, crossed the Rhine River at Wesel and the Elbe River en route to Zerbst. Withdrawn to take up occupation duties in the Harz Mountains. The 644th TD Battalion, equipped with the M10 3in. GMC, served with the 8th Infantry Division from July 1944 until the end of the war, except for interludes when elements of the battalion supported the 2nd Infantry Division in the Ardennes from December 12, 1944, to January 27, 1945, and the 99th Division from January 28 to February 8, 1945. Redesignated from the 44th Antitank Battalion (Provisional) at Fort Dix, New Jersey, on 15 December 1941. Arrived at Gourock, Scotland, in January 1944. Landed at Utah Beach on 11 and 12 July equipped with M10s. Committed to battle south of Le Haye Du Puits with the 8th Infantry Division on 15 July. Participated in Cobra breakout beginning 26 July. Advanced into Brittany in August and helped capture Brest in early September. Moved to Luxembourg in late September. Fought in the Hürtgen Forest in November. Companies A and C moved to the northern Ardennes sector by early December and participated in the Battle of the Bulge, with Company B arriving late in the game. Joined in elimination of the Bulge in early 1945 and the Roer River offensive in February. Reached the Rhine south of Cologne in March. Crossed river at Remagen and supported the reduction of the Ruhr Pocket in April. Swung eastward to the Elbe River and rolled toward the Baltic coast with the 82d Airborne Division, stopping in Schwerin. Attached to: 82d Airborne Division; 3d Armored Division; 1st, 2d, 8th, 9th, 86th, 99th, 104th Infantry divisions; 102d Cavalry Group. The 645th TD Battalion served during the North Africa and Sicily campaigns, and deployed from Italy with the 45th Division in southern France, serving with it until the end of March 1945, except for a few weeks with the 42nd Division in late February and a few days in late March with the 75th Division. It began with the M10, but was completely reequipped with the M36 by January 1945. Activated on 15 December 1941 at Camp Barkely, Texas. Battalion arrived in Algeria on 27 May 1943. Landed at Paestum, Italy, on 9 September 1943. Participated in drive up the Italian peninsula, then shifted to Anzio beachhead in February 1944. Withdrawn for training in June 1944 to participate in Operation Dragoon. Landed on 15 August in southern France. Advanced to Vosges Mountains near Grandvillers by October. Joined assault on Siegfried Line in December near Bobenthal, Germany. Fought German Nordwind offensive in January 1945. Converted to M36 beginning late January. Attacked Siegfried Line again south of Sarreguemines in March, crossed the Rhine at Worms on 25 March. Helped reduce Nazi stand at Aschaffenburg at month’s end and capture Nürnberg in mid-April. Reached Munich on 29 April. Attached to: 36th, 45th Infantry divisions. The 648th TD Battalion served with the 70th Division from February 20, 1945, until the end of March and in April 1945 supported the 86th Division. It did not convert from towed to self-propelled until after the end of the war. Activated on 6 March 1943 at Camp Bowie, Texas. Converted to a towed battalion in March 1944. Arrived in the United Kingdom by 19 December 1944. Committed to battle near Luneville, France, in February 1945. Began conversion to M18s in early April while near Landstuhl, Germany. Ended war in vicinity of Ingolstadt. Attached to: 36th, 70th, 86th Infantry divisions. The 654th TD Battalion supported the 35th Division for most of the fighting in Europe, except for December 22-25 when it supported the 5th Infantry Division. 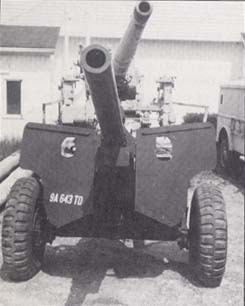 It was initially equipped with the M10 3in. GMC and subsequently with the M36. Activated on 15 December 1941 at Fort Benning, Georgia. Disembarked at Omaha Beach on 11 July 1944 with M10s. Committed to battle on 12 July near Fallot, France. Fought at Mortain in August, then advanced across France toward Nancy. Fought along border and crossed the Saar River in early December. Deployed to the Ardennes sector on 21 December. Shifted back south to Metz region in January 1945. Returned to Belgium in February and converted to the M36. Participated in the offensive across the Roer River and then across the Rhine on 24 March. Advanced to Tangerhutte and remained there until taking on military government duties in early May. Attached to: 5th, 30th, 35th, 75th Infantry divisions. Activated on 3 April 1943 at Camp Bowie, Texas. Arrived in England in December 1944. Disembarked at Le Havre, France, on 6 February 1945 equipped with M18s. Entered the line near Friesenrath, Germany, on 28 February. Pushed toward Rhine River at Remagen and crossed into bridgehead beginning 7 March. Converted to the M36 late that month. Supported 9th Armored Division sweep to help encircle the Ruhr in early April and then dashed eastward to the Mulde River. Turned south and entered Czechoslovakia near St. Sedlo on 6 May. Attached to: 9th Armored Division; 78th Infantry Division. Activated on 17 April 1943 at Camp Bowie, Texas. Arrived at Le Havre, France, on 21 January 1945 equipped with M18s. Committed to battle at Rocherath-Krinkelt, Belgium, on 16 February 1945. Fought along the Siegfried Line near Helenthal, Germany, in March. Crossed the Rhine on 27 March and advanced across Germany to Leipzig by 17 April, where the men saw their last fighting. Attached to: 28th, 69th, 106th Infantry divisions. Activated on Jun. 12, 1943 at Camp Hood, TX. Unit shipped from Seattle post of embarkation on Dec. 28, 1944, landing on Hawaii on Jan. 5, 1945. Shipped to Philippines in July of 1945 preparing for invasion of Japan. Returned to U.S. via Los Angeles port on Jan. 16, 1946. 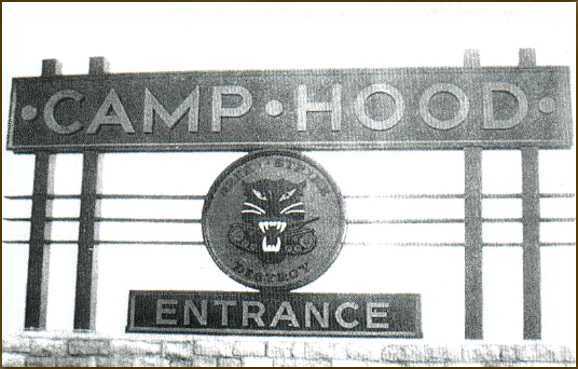 Unit was deactivated on Jan. 17, 1946 at Camp Anza, CA. Activated on 26 June 1943 at Camp Hood, Texas, as one of several battalions with black enlisted personnel and mostly white officers. Converted to a towed battalion on 14 July. Disembarked at Le Havre, France, on 21 January 1945, then re-embarked at Marseilles on 1 March for transfer to Italy. Entered the line in IV Corps sector on 17 March. Supported assault on La Spezia in April and advanced to Genoa by early May. Attached to: 92d Infantry Division. The 691st TD Battalion was deployed as a towed AT gun battalion. It first supported the 35th Division on September 5-9, 1944, the 80th Division on September 16-18, and the 26th Division from mid-October until early December 1944. 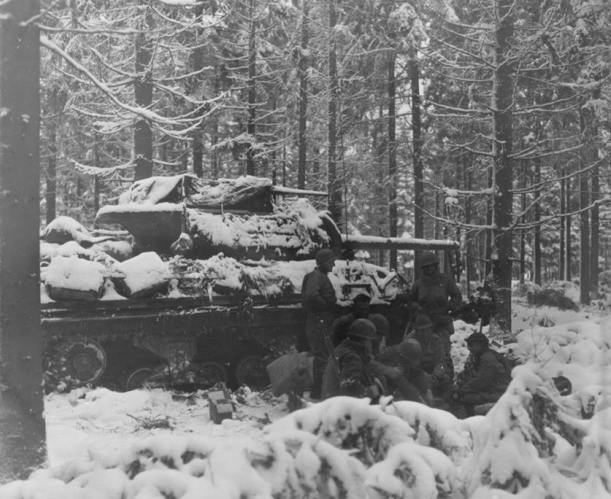 During the Battle of the Bulge it was attached to the 6th Armored Division during the middle of December, and then to the 87th Division at the end of the month. It served with the 76th Division from late January through February 1945, the 65th Division through most of March and was partly reequipped in one company with the M36 90mm GMC at the end of March 1945. It was subsequently attached to the 76th Division from early April until the end of the war. Elements of the battalion supported the 8th Armored Division at various times from early February to May 1945. Activated on 15 December 1941 at Fort Bliss, Texas. Entered combat in September 1944 in Lorraine equipped with towed guns. Transferred to Ardennes sector in December. Shifted south again and joined operations in the Saar region in February and March 1945. Converted to the M36 beginning late that month. Advanced across Germany and reached Limbach on 24 April, where action all but ceased. Attached to: 17th Airborne Division; 6th Armored Division; 5th, 26th, 35th, 44th, 65th, 76th, 80th, 87th Infantry divisions; 2d Cavalry Group. remained with the division until early March 1945. It served for most of the remainder of the war with the 42nd Division and converted to the self-propelled M36 GMC in early February 1945. Activated on 10 April 1942 at Camp Gordon, Georgia. Converted to a towed battalion in March 1944. Arrived at Cherbourg, France, on 23 September 1944. Entered the line near Wustwezel, Belgium, circa 28 October. Fought along the Siegfried Line in the vicinity of Stolberg beginning in November. Occupied defensive positions along the Roer River during the Battle of the Bulge. Converted to the M36 in February 1945, supported the drive from the Roer to the Rhine River in late February and early March, and helped capture Cologne. After clearing more Siegfried Line fortifications, crossed the Rhine at Worms on 31 March. Raced across Germany in April and participated in the capture of Furth. Advanced to Munich by 30 April. Attached to: 42d, 63d, 104th Infantry divisions. Activated on 15 December 1941 at Fort Knox, Kentucky. Attached to 1st Armored Division, which had provided most of cadre personnel. Arrived at Belfast, Northern Ireland, on 11 June 1942. Companies B and C and one platoon of Recon Company participated in Operation Torch landings 8 November near Oran. Advanced toward Tunisia beginning 16 November. Rest of battalion reached North Africa on 10 December. Actions in Tunisia, usually attached to the 1st Armored or 1st Infantry Division, included El Guettar, Faid Pass, Sidi Bou Zid, Sbeitla, Hill 609, and Mateur. Shipped to Italy in October 1943 and entered the line in the Pagnataro area. 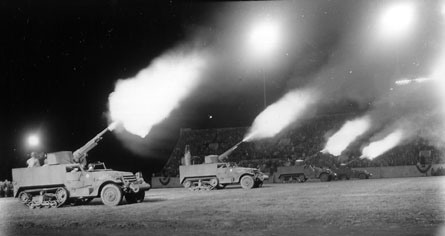 TDs operated largely as artillery. For much of early 1944, the battalion was attached to II or VI Corps in Cassino sector. Shipped to Anzio beachhead in February 1944. Supported 1st Armored Division during breakout in late May, entered Rome on 4 June. Pushed north to the Arno River, crossed river on 1 September, and reached Florence area. Spent winter training and firing artillery missions. Supported 10th Mountain Division drive into the Po River valley in April 1945. Entered Verona on 26 April. Attached to: 1st Armored Division; 1st, 3d, 9th, 34th, 45th, 88th, 92d Infantry divisions; 10th Mountain Division; British 78th Infantry Division; Brazilian Expeditionary Force. 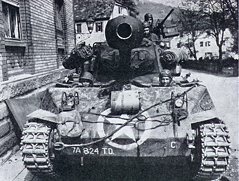 The 702nd TD Battalion spent most of the European campaign attached to the 2nd Armored Division originally with the M10 3in. GMC and later with the M36 90mm GMC. The “Seven O Deuce” was activated 15 December 1941 at Fort Benning, Georgia. Equipped with T70s (M18s) before shipping to the United Kingdom, where the battalion arrived on 25 February 1944 only to be issued M10s. Landed at Omaha Beach on 11 June. Entered line at Livry on 2 July. Formed part of 2d Armored Division’s spearhead during Cobra breakout in late July. Fought at Mortain, established first contact with Canadians during encirclement of Falaise Pocket. Entered Belgium on 5 September and crossed German border near Gangelt Fought against Siegfried Line along Wurm River in October and November. Re-equipped with M36s in late November. Supported drive on Roer River. Moved to Ardennes in December. Crossed Roer River on 28 February 1945 and Rhine on 28 March. Participated in encirclement of Ruhr Pocket, reached Weser River on 4 April. Reached Elbe River near Magdeburg, after which took on occupation duties. Attached to: 2d Armored Division. The 703rd TD Battalion spent most of the campaign in Europe with the 3rd Armored Division except for a brief interlude during the Battle of the Bulge when it was attached to the lst Infantry Division in the fighting along Elsenborn Ridge. It was originally equipped with the M10 3in. GMC and reequipped with the M36 90mm GMC by the end of the campaign. Activated on 15 December at Camp Polk, Louisiana. Landed in France on 1 July 1944. Saw first action near Hautes Vents on 13 July. Participated in Cobra breakout at end of month. Held in reserve during Mortain battle in August. Crossed the River Seine on 26 August, reached the Siegfried Line in the vicinity of Eschweiler, Germany, by 12 September. First battalion converted to M36s beginning 30 September. Fought along West Wall until mid-December, when transferred to Ardennes after launch of German offensive. Fought to reduce the Bulge in January 1945 and joined drive to Cologne in February and early March. Crossed Rhine River on 23 March near Honnef and participated in envelopment of the Ruhr. Slashed east to stop line at Dessau by 14 April. Attached to: 82d Airborne Division; 3d Armored Division; 1st Infantry Division. The 704th TD Battalion was one of the first M18 battalions to see service and it entered combat with the 4th Armored Division during Operation Cobra in July 1944. It remained with the 4th Armored Division, except for some brief attachments to the 87th Division in mid-December 1944 and the 94th Division in January-March 1945. It received a handful of M36s shortly before the end of the war. Activated on 15 December 1941 at Camp Pine, New York. Arrived in the United Kingdom by April 1944. First battalion in the ETO to receive M18s, which occurred in May. Landed at Utah Beach on 13 July. Participated in Cobra breakout at end of month, advanced into Brittany. Raced east across France, passing north of Orleans, and crossed the Moselled River to Luneville in early September and remained in the general area through October. Fought in Morhange region in November and crossed the Saar River by month’s end. Deployed to Ardennes on 19 December. Fought around Bastogne in January 1945, then moved back south. Advanced into Germany near Sinz in February, fighting through Siegfried Line and into the Saar-Moselle triangle. Supported drive to Bitburg in March and reached Rhine by mid-month. Crossed the river on 24 March at Nierstein. Roared east to Gotha by 4 April, passed through Harz Mountains to Bayreuth in late April. Entered Czechoslovakia at Volyne on 6 May. Attached to: 101st Airborne Division; 4th Armored Division; 26th, 87th, 94th Infantry divisions; 6th Cavalry Group. The 705th TD Battalion was equipped with M18 76mm GMC and first supported the 95th Division in mid-October 1944. During the Battle of the Bulge, it supported the l0lst Airborne Division during the defense of Bastogne, and became famous for its efforts in defeating the attacks of the German 15th Pz.Gren. Division over Christmas. In late February, it was attached to the l lth Armored Division and remained with it until the end of the war. It received a handful of M36s shortly before the end of the war. Activated on 15 December 1941 at Fort Knox, Kentucky. Arrived at Gourock, Scotland, on 27 April 1944. Landed at Utah Beach on 18 July equipped with M18s. Joined Cobra breakout and swept through Brittany to Brest in late July and early August. Helped clear Crozon Peninsula into September. Moved across France in October to Moselle River. Advanced to German border at Kitzing in mid-November. Shifted north to Aachen area in early December. Moved to Bastogne, where TDs participated in famous defense by 101st Airborne Division. Supported drive to Rhine River in March 1945. Crossed river on 29 March at Oppenheim. Conducted drive across Germany through Bayreuth in April, arriving in Neukirchen, Austria, by 6 May. Attached to: Task Force A; 101st Airborne Division; 11th Armored Division; 29th, 83d, 95th Infantry divisions. The 771st TD Battalion supported the 77th Division in late September 1944, and was attached to the 102nd Division from early November for most of the rest of the war aside from some interludes with the l lth Cavalry Group. It was originally equipped with the M10 3in. GMC and later with the M36 90mm GMC. Activated on 15 December 1941 at Ft. Ethan Allen, Vermont. Arrived at Glamorganshire, Wales, on 1 January 1944 and shipped to France in late September equipped with M10s. Entered combat with the 102d Infantry Division against the Siegfried Line defenses along the Würm River on 3 November. Participated in the drive to the Roer River and held defensive positions there during December. Converted to the M36 in January 1945. Supported drive toward Rhine River in February. Crossed the Rhine beginning 31 March and joined the 102d Infantry Division’s drive across Germany to the Elbe River, reaching same on 14 April. Spent remainder of the war helping to mop up bypassed pockets of resistance between the Rhine and the Elbe. Attached to: 5th Armored Division; 102d Infantry Division; 11th Cavalry Group. The 772nd TD Battalion was a towed 3in. AT gun unit and deployed in support of the 83rd Division on December 22 during the Battle of the Bulge, until being transferred to the 75th Division where it remained for most of the rest of the war. It was reequipped with the M36 by the end of the campaign. Activated on 16 December 1941. Entered the line near Birgel, Germany, on 22 December 1944. Fought in Belgium in January 1945, then shifted south to Seventh Army’s sector along the Rhine in February. Converted to the M36 beginning in late March. Supported operations against the Ruhr Pocket in April and then took on military government duties. Attached to: 30th, 75th, 83d, 106th Infantry divisions. The 773rd TD Battalion, equipped with M10 3in. GMC, supported the 79th Division starting in early September 1944 during the fighting on the French/Belgian border, the 95th Division starting in late October 1944, and finally the 90th Division from the beginning of November until the end of the war. It retained the M10 through the campaign, but received a handful of M36s shortly before the end of the war. A snow camouflaged M10 from the 773rd Tank Destroyer Battalion. The 774th TD Battalion was a towed AT gun unit and supported the 5th Infantry Division starting in mid-September 1944 near Metz, the 95th Division in late October, and then returned to support the 5th Infantry Division for most of November. During the fighting in the Ardennes, it supported the 90th Division from December 21 until early January and then was attached to the 94th Division from early January until the end of the war. It was reequipped with the M36 90mm GMC in late January 1945. Activated on 15 December 1941 at Camp Blanding, Florida. Converted to a towed battalion before arriving at Gourock, Scotland, on 12 June 1944. Debarked at Utah Beach on 7 August. Joined fighting around Argentan. Ran eastward across France to Lorraine as part of a cavalry screen and the 7th Armored Division. Participated in fighting around Metz starting in September. Fought along the Saar in December and then joined rush north to the Ardennes. 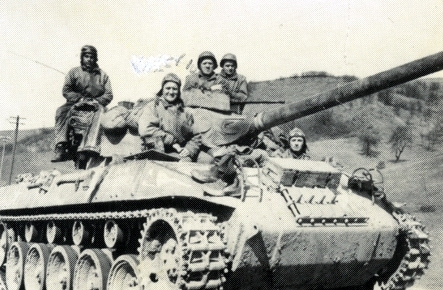 Converted to the M36 in late February 1945. Drove to the Rhine in March. Held Rhine west of the Ruhr Pocket in April, then took on military government duties. Attached to: 7th Armored Division; 5th, 80th, 90th, 94th, 95th Infantry divisions; 43d Cavalry Group. The 776th TD Battalion served in North Africa and Italy, and was shipped to France in October 1944. It supported the 44th Division from November along the Maginot Line through the end of the war, except for some attachments to the 63rd Division in late March 1945 and the 4th Infantry Division in mid-April. It was originally equipped with the M10 3in. GMC and was reequipped with the M36 90mm GMC by November 1944. On 21 December 1941, a provisional antitank battalion of the 76th Field Artillery Brigade was activated as the 776th Tank Destroyer Battalion. Issued M10s while still in the States. Arrived Casablanca, Morocco, 25 January 1943. Fought in area of Maknassy and Ferryville, Tunisia. Eighteen enlisted men participated in Sicily campaign as radio operators and military police. Debarked vicinity of Cappaci, Italy, beginning 19 September 1943. Main body committed near Rotondi 10 October 1943, where it supported the Volturno River crossing. Supported Rapido River crossing and fought near Cassino and in January–March 1944. Joined breakthrough of Hitler Line May 1944, entered Rome 4 June, and joined drive to Arno River. Transferred to southern France in September–October 1944, during which drew M36s. Moved into line near Luneville on 30 October 1944. Supported French 2d Armored Division advance to Strasbourg in November. Battled German Nordwind offensive around Rimling, France, in January 1945, where claimed first Jagdtiger destroyed on Western front. Attacked Siegfried Line near Omersheim, Germany, and crossed Rhine River near Worms in March 1945. Aided capture of Mannheim, Heidelberg, and Ulm, Germany, and crossed Danube in April 1945. Ended war in Ehrwald, Austria. Attached to: 1st Armored Division; 4th, 34th, 44th, 63d, 85th, 100th Infantry divisions. The 801st TD Battalion equipped with the towed 3in. gun, supported the 4th Infantry Division from June 13 through early November, the 99th Division until early February, the 30th Division in late February and the 83rd Division through mid-April 1945. It was partly reequipped with the M18 76mm GMC in late March 1945 while in the Harz Mountains. 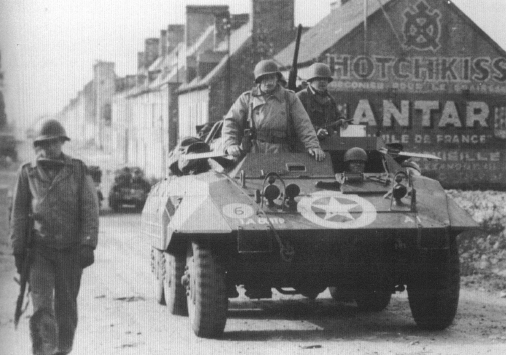 M20 Armored Car with Commander, Company "A" 801st TD BN. As 101st New York National Guard Antitank Battalion was federalized on 6 January 1941 and redesignated 801st Tank Destroyer Battalion on 15 December. Arrived in England as a towed battalion 11 March 1944. Landed at Utah Beach on 13 June and participated in capture of Cherbourg. Fought at Mortain in early August, reached outskirts of Paris on 25 August. Entered Belgium on 8 September and Germany on 12 September. Supported operations in Hürtgen Forest beginning late November. On the line in Ardennes when German offensive struck on 16 December. Moved to Aachen, Germany, in February 1945. Crossed Roer River on 25 February and reached Rhine south of Düsseldorf. Crossed Rhine near Wessel on 29 March and supported drive to the Ruhr and then east to the Elbe River. Transferred south and supported operations in Harz Mountains in late April. Converted to M18s in late April. Crossed Danube and reached Inn River outside Hitler’s birthplace—Brunnau, Austria—by VE Day. Attached to: 2d, 13th Armored divisions; 2d, 4th, 9th, 83d, 99th Infantry divisions. The 802nd TD Battalion began as a towed AT gun unit and deployed with the 83rd Division in Normandy in early July 1944, remaining in support of the unit until early December. It supported the 4th Infantry Division on the southem shoulder of the Ardennes front through Christmas. It was attached to the 80th Division in late January and the 95th Division in early February, remaining with the 95th through most of the rest of the fighting. It was reequipped with tbc M36 90mm GMC in early March 1945. The New York National Guard’s 102d Antitank Battalion was federalized on 13 January 1941 and converted into the 802d Tank Destroyer Battalion on 15 December at Camp Shelby, Mississippi. Disembarked in France on 1 July 1944 as a towed battalion. Entered battle near Carentan on 4 July. Advanced into Brittany in August and supported attack on St. Malo in August. Crossed France and entered Luxembourg on 23 September. Supported operations against Siegfried Line through November. Participated in Battle of the Bulge in Luxembourg in late December. Converted to M36s in February–March 1945. Crossed Rhine River at Wessel on 2 April. Joined elimination of Ruhr Pocket, after which took on occupation duties. Attached to: 4th, 80th, 83d, 95th Infantry divisions. The 803rd TD Battalion served with the 3rd Armored Division during the Normandy fighting in June and July 1944, before deploying for a few weeks with the troubled 90th Division in early July and the 28th Division in late July 1944. It supported the 4th Infantry Division on the southern Ardennes front from early November until Christmas, and was attached to the Sth Infantry Division from Christmas until the end of the war. It was originally equipped with the M10 3in. GMC and later with the M36 90mm GMC. Initially activated as the 103d Antitank Battalion on 30 September 1940 from Washington National Guard troops, federalized on 10 February 1941, and redesignated 803d Tank Destroyer Battalion on 12 December 1941. Departed for England on 24 June 1943. Landed at Omaha Beach on 13 June 1944 equipped with M10s. Helped capture St. Lô in July. Raced across northern France in August and passed through Belgium and Holland before reaching the Siegfried Line in September. Supported operations north of Aachen in October, transferred to Hürtgen Forest. Shifted to Ardennes just before German offensive began in December. Committed against Siegfried Line again in early 1945. Converted to the M36 in February. Participated in capture of Trier, crossed Rhine River on 23 March at Oppenheim. Joined elimination of Ruhr Pocket in April, then pivoted and marched southeast through Austria and into Czechoslovakia. Attached to: 82d Airborne Division; 3d Armored Division; 2d, 5th, 8th, 29th, 30th Infantry divisions; 1st Belgian Brigade. Converted in January from the 104th Infantry Antitank Battalion, 45th Infantry Division, at Camp San Luis Obispo, California. Arrived Belfast, Ireland, on 17 August 1942 and at Oran, Algeria, on 1 February 1943. Trained French troops on M10s in North Africa; only battalion observers went to front. Landed at Naples, Italy, on 8 February 1944, and moved Gustav Line along Garigliano River by 9 March. Entered Rome on 4 June. Carried doughs into Livorno on 18 July. Crossed Arno River in September, then supported attack on Gothic Line through October. Broke into Po River Valley in April 1945, crossed Po River on 27 April. Company C part of column that linked up with U.S. Seventh Army troops in Brenner Pass on 5 May. Attached to: 34th, 85th, 88th, 91st Infantry divisions. 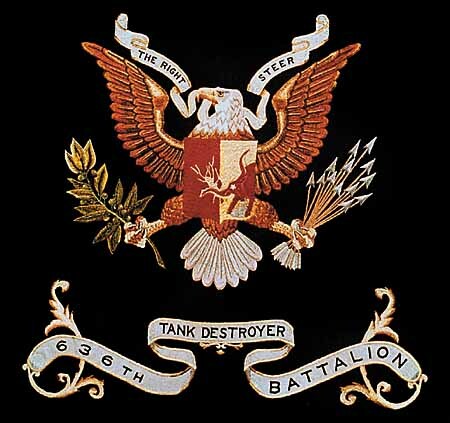 105th Antitank Battalion redesignated 805th Tank Destroyer Battalion on 15 December 1941. Arrived in England 18 August 1942. Landed at Algiers 17 January 1943. Actions included Kasserine Pass and Gafsa. Converted to towed 3-inch gun battalion in October 1943. Debarked in Italy 28 October 1943 at Bagnoli. Shipped to Anzio beachhead 12 March 1944. Served largely as artillery even after re-equipped with M18s in June–August. TDs were part of advance guard at capture of Bologna and Brenner Pass. Attached to: 34th, 85th, 91st Infantry divisions. Formed on Mar. 15, 1943 at Camp Gordon, GA as Heavy Self-Propelled. Sailed from San Francisco on Aug 12, 1945 landing at Eniwetok Atoll on Sep. 1, 1945. Landed Philippines on Oct. 8, 1945. Returned to Los Angeles Port on Jan. 11, 1946. Deactivated Jan. 11, 1946 at Camp Anza, CA. The 807th TD Battalion was a towed AT gun unit and first supported the 83rd Division in late September and early October 1944. It was attached to the 5th Division in early December and the 90th Division in late December 1944 during the Ardennes fighting. The battalion was deployed with the l0lst Airborne Division for a month starting in late January 1945, and was then deployed in a succession of short assignments with the 35th Division in early March, the 30th and 75th Divisions in late March, and the 86th Division from late April until the end of the war. It began receiving the M18 shortly before the end of the campaign but was not fully reequipped. Activated 1 March 1942 at Camp Cooke, California. Arrived Liverpool, England, on 23 August 1944 and at Utah Beach on 18 September. Fought in Metz sector from September to November. Attacked toward Saarlautern in November and December. Battled German Nordwind offensive in January 1945. Shifted north for offensive to the Rhine in March. Defended Rhine River bridges in April and converted to the M18 in time to join the drive through Bavaria late in the month. Reached vicinity of Salzburg, Austria, in early May. Attached to: 101st Airborne Division; 5th, 30th, 35th, 75th, 83d, 86th, 90th, 95th, 100th Infantry divisions; 3d Cavalry Group. The 808th TD Battalion served with the 80th Division from late September through Christmas in a towed AT gun configuration. It converted to M36 90mm GMC in late January 1945. It supported the 76th Division during March 1945 and was attached to the 65th Division from April 5 until the end of the war. Activated 27 March 1942 at Camp Joseph T. Robinson, Arkansas. Reorganized as a towed battalion in May 1943. Disembarked at Utah Beach on 19 September 1944. Entered the line east of the Moselle River six days later, where it remained until transferring to the Ardennes on 21 December. Protected XII Corps flank through January 1945. Converted to the M36 in February. Supported drive to the Rhine in March and the river crossings south of Boppard late in the month. Joined Third Army’s drive through Erfurt, Nürnberg, and south into Bavaria. Advanced to Linz, Austria, in early May. Attached to: 5th, 65th, 76th, 80th Infantry divisions; 2d, 6th Cavalry groups. The 809th TD Battalion was equipped with M18 76mm GMC and served from February 9 until the end of the war with the 8th Armored Division, except for some assignments with the 79th Division in late March and the 95th Division in early April. It received a small number of M36s towards the end of the campaign. Activated 18 March 1942 at Camp Forrest, Tennessee. Arrived at Liverpool, England, on 8 December 1944 and Le Havre, France, on 20 January 1945 equipped with M18s. Supported Roer River crossing in late February 1945. Crossed the Rhine on 27 March. 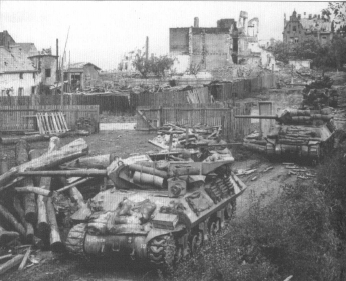 Supported operations against the Ruhr Pocket in April and converted to the M36 that same month. Helped clear the Harz mountains in late April. Attached to: 8th Armored Division; 79th, 95th Infantry divisions. The 811th TD Battalion was equipped with the M18 76mm GMC and first deployed with the 9th Armored Division in November 1944. It served with the division during the Battle of the Bulge and was transferred to support the 17th Airborne Division during the final two weeks of fighting in the Ardennes in January 1945. It was subsequently attached to the llth Armored Division in early February before being attached to the 80th Division where it remained for most of the rest of the war. Activated 10 April 1942 at Camp Gordon, Georgia. Arrived at Cherbourg, France, on 15 September 1944 equipped with M18s. Moved to Luxembourg in November and participated in the Battle of the Bulge in December. The battalion was scattered widely and pieces attached to many divisions into January 1945. Supported operations against the Siegfried Line in February and early March. Advanced to the Rhine in late March and crossed river on 30 March. Supported 80th Infantry Division in capture of Kassel and advance to Erfurt and Chemnitz in April. Moved south and crossed Danube River to Regensburg. Entered Austria on 5 May. Attached to: 17th, 101st Airborne divisions; 4th, 9th, 11th Armored divisions; 28th, 78th, 80th, 87th, 89th Infantry divisions; 3d Cavalry Group. The 813th TD Battalion served in North Africa and first deployed with the 79th Division in Normandy on July 1, 1944, remaining with the division for most of the war, except for assignments to the 44th Division in the last week of October 1944, and the l0lst Airborne Division in the last few days of the war in May 1945. It was originally equipped with the M10 3in. GMC and later with the M36 90mm GMC. Activated 15 December 1941 at Fort Bragg, North Carolina. Arrived in North Africa on 17 January 1943, where it supported British, French, and American troops in Tunisia. Re-equipped with M10s after end of hostilities. The battalion sent six officers and 400 men to Sicily to handle POWs. Two platoons served briefly in southern Italy before battalion sailed to the United Kingdom in November 1943. Disembarked at Utah Beach on 27 June 1944. Joined drive to Le Mans and then north to Alencon at Falaise Gap. Was first armored unit to cross the Seine River. Entered Belgium 2 September 1944. Moved south and fought around the Foret de Parroy in October. 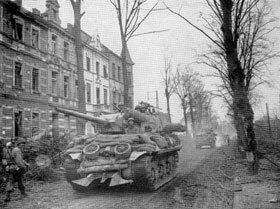 Supported advance to Strasbourg in November, where Recon Company actually preceded 2d French Armored Division to within one mile of Rhine. Battled German Nordwind offensive in January 1945, partially re-equipped with M18s after heavy losses. Shifted to Belgium in February, re-equipped again with M36s. Crossed Rhine River 24 March, participated in reduction of Ruhr Pocket. Conducted long roadmarch south to Ulm. Took on military government duties in early May. Attached to: 44th, 79th, 84th Infantry divisions; 106th Cavalry Group. The 814th TD Battalion served with the 7th Armored Division starting in mid-August 1944 and remained with it, except for some short assignments to the 75th Division in the first week of January 1945 and the 99th Division in the second week of February 1945. It was originally equipped with the M10 3in. GMC and later with the M36 90mm GMC. Activated by 1 May 1942 at Camp Polk, Louisiana. Arrived at Greenock, Scotland, in February 1944. Landed at Utah Beach beginning 8 August equipped with M10s. Raced across France in August and participated in fighting around Metz in September. Transferred to Peel Marshes in Holland in late September. Began re-equipping with M36s in October, then supported Ninth Army’s drive toward the Roer River in November. Transferred with 7th Armored Division to the Ardennes on 17 December and participated in the defense of St. Vith. Supported operations against the West Wall in February 1945. Crossed the Rhine River at Remagen on 23 March. Helped reduce the Ruhr Pocket in April. Drove east to the Elbe River and crossed, reaching the Baltic coast on 3 May. Attached: 7th Armored Division; 113th Cavalry Group. The 817th TD Battalion was equipped with the M18 76mm GMC and first deployed with the 78th Division in early December 1944 along the Siegfried Line. It supported the 8th Infantry Division for most of December 1944 through early February and subsequently the 99th Division in late February and the 104th Division in April and May 1945. 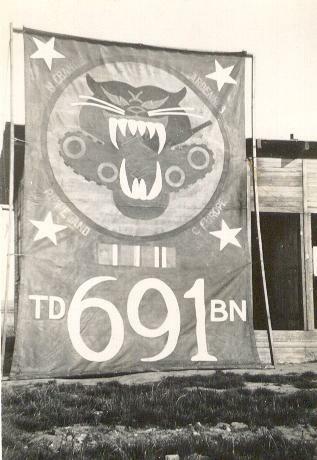 The 818th TD Battalion deployed with the 5th Infantry Division on July 13 and remained with the division until late December, when it was attached to the 26th Division for the duration of the war. It was originally equipped with the M10 3in. GMC and later with the M36 90mm GMC. Activated on 15 December 1941 at Fort Sill, Oklahoma. Arrived in North Ireland on 1 November 1943. Landed in France on D+36 with towed guns. Advanced across France during August and September to the area of Metz. Supported operations along the Saar until December, when transferred to the Ardennes sector. Participated in race across Germany beginning in March 1945. Converted to M36s prior to mid-April. Ended the war in Kienberg, Czechoslovakia. Attached to: 5th, 26th Infantry divisions. 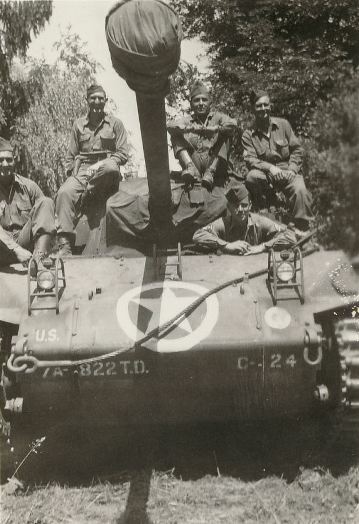 Activated on June 1, 1942 at Camp Chaffee, AR as a Heavy Self-Propelled unit. Shipped from San Francisco port of embarkation on Mar. 15, 1944 and landed in Hawaii on Mar. 21, 1944. Landed Palau on Feb. 1, 1945. The 820th TD Battalion was a towed 3in. AT gun unit and deployed with the ill-fated 106th Division that was overrun in the opening phase of the Battle of the Bulge near St. Vith. Surviving elements of the battalion retreated with the 7th Armored Division and served in the later fighting against the 2nd SS-Panzer Corps. It was reequipped with M18 tank destroyers in March 1945. The battalion was attached to the 97th Division in late April and remained with it until the end of the war a few weeks later. Activated on 25 June 1942 at Camp Swift, Texas. Arrived Liverpool, England, on 15 October 1944 and at Omaha Beach with towed guns two days later. Moved to the Ardennes sector in early December, where the battalion was deployed with the 106th Infantry Division in the path of the German offensive. Converted to M18s in early 1945. Supported operations in the Ruhr Pocket in April 1945. Crossed Germany to Mesto Touskov area in Czechoslovakia by early May. Attached to: 13th Armored Division; 97th, 106th Infantry divisions. The 821st TD Battalion deployed in Normandy as a towed AT gun unit and supported the 35th Division in the July fighting. The battalion was reorganized as a self-propelled battaIíon in late December 1944 with the M10. Activated on 25 July 1942 at Camp Carson, Colorado. Arrived in England 17 April 1944. Disembarked at Omaha Beach 26 June with towed 3-inch guns. Supported capture of St. Lô and subsequent breakout. Entered Brittany in August, supported capture of Brest by 18 September. Moved east in late September to Holland. Conducted operations against Siegfried Line in October near Aachen, Germany. Transferred to Ubach, Germany, in November and supported drive toward Roer River. Converted to M10s beginning in December. Crossed Roer beginning 23 February 1945. Withdrawn from line during March. Company B supported operations against Ruhr Pocket in April. Battalion then marched east to Elbe River. Took up occupation duties on 27 April. Attached to: 29th, 35th Infantry divisions. The 822nd TD Battalion was equipped with towed AT guns and first deployed with the 63rd Division on February 6, 1945, along the Saar River. It served with the division until the end of the war. It was reequipped with the M18 76mm GMC in mid-April 1945. Activated on 25 July 1942 at Camp Carson, Colorado. Arrived at Le Havre, France, on 23 January 1945 with towed guns. Entered line with 63d Infantry Division near Sarreguemines on 7 February. Crossed Rhine River on 27 March and reached Heidelberg on 1 April. Reorganized as self-propelled battalion in mid-April, although the battalion possessed some M18s by late March. Advanced across Germany, reached Munsterhausen on 27 April, and took up occupation duties. Attached to: 36th, 63d Infantry divisions. The 823rd TD Battalion was equipped with towed 3in. anti-tank guns and first deployed in support of the 30th Division in late June, fighting in support of the division in the critical battles including the defense of Mortain in July 1944. 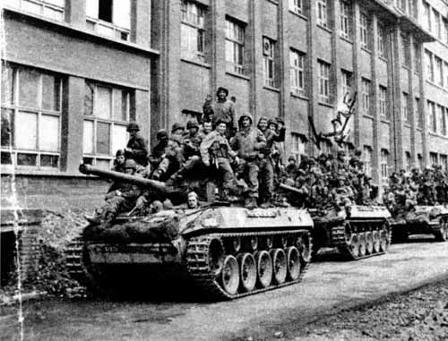 The battalion was reorganized with the M10 3in. GMC in mid-December 1944. 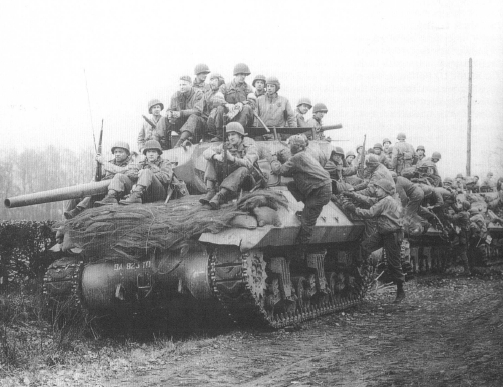 Infantry from the 30th Infantry Division (Old Hickory) mount up on an M10 Tank of the 823rd Tank Destroyer Battalion. Activated on 25 July 1942 at Camp Carson, Colorado. Arrived in England in April 1944. Landed at Omaha beach on 24 June with towed 3-inch guns. Supported drive on St. Lô. Fought at Mortain in August. Passed through Belgium and Holland, and entered Germany on 17 September. Fought along Siegfried Line in October, including encirclement of Aachen. Converted to M10s beginning in November. Shifted to the Ardennes in late December and fought to eliminate the Bulge in January 1945. Crossed Roer River on 24 February and Rhine on 24 March. Raced eastward to Elbe River at Magdeburg in April. Began military occupation duties on 21 April. Attached to: 29th, 30th Infantry divisions. The 824th TD Battalion deployed with the 100th Division as a towed unit on November 26 during the Vosges fighting and remained with it until late April. It was reequipped with the M18 76mm GMC in mid-March 1944. It was attached to the 103rd Division on April 24, remaining with it for the last two weeks of the war. Activated on 10 August 1942 at Camp Gruber, Oklahoma. Reorganized as a towed battalion in May 1943. Arrived at Marseilles, France, on 29 October 1944. Deployed near Sarrebourg on 27 November. Fought around Bitche and against Siegfried Line in December. Battled German Nordwind offensive in January 1945. Converted to M18s in March and crossed the Rhine on the last day of the month. Joined the stiff fight at Heilbronn on 8 April and then advanced to the Austrian border by month’s end. Cleared the Bavarian mountains and took Innsbruck in early May. Attached to: 45th, 100th, 103d Infantry divisions; 106th Cavalry Group. Activated on 10 August 1942 at Camp Gruber, Oklahoma. Reorganized as a towed battalion in July 1943. Assigned to Communications Zone and 12th Army Group security duties between August and December 1944. On 17 December, the battalion entered combat near Malmedy, Belgium. Returned to security duties on 16 January 1945. Attached to: 30th Infantry Division. The 827th TD Battalion (Colored) converted from towed AT guns to M18 76mm GMC in July 1944 before being deployed to France in November 1944. 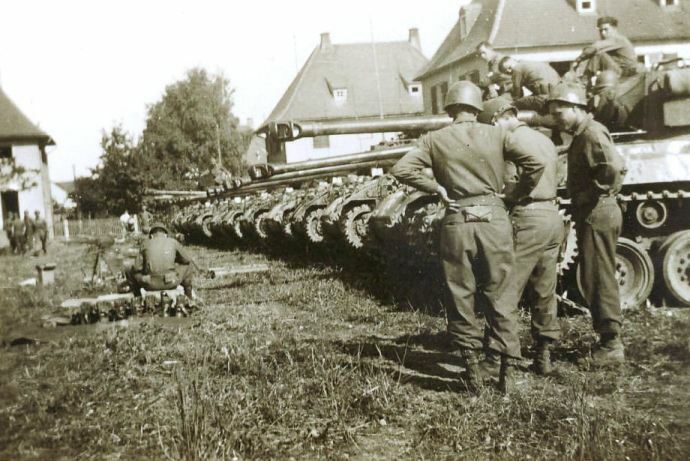 The unit was poorly trained and, after poor performance during the fighting in Hatten-Rittershoffen in Alsace, it was withdrawn in mid-February 1945. Activated on 20 April 1942 at Camp Forrest, Tennessee. One of several battalions with black enlisted personnel and largely white officers. Reorganized as a towed battalion in June 1943. Arrived in Seventh Army’s sector east of the Vosges at the height of the German Nordwind offensive in January 1945, equipped with M18s. Fought to eliminate the Colmar Pocket in late January and early February. Transferred to Communications Zone for security duties in March and subsequently undertook other rear-area functions. Attached to: 12th Armored Division; 79th Infantry Division. The 893rd TD Battalion, equipped with the M10 3in. GMC, served with the 4th Infantry Division starting on August 23, 1944. In late October it supported the 28th Division during the opening phase of the Hürtgen Forest fighting, and was attached to the 78th Division from December 11, 1944, until the end of the war. It retained the M10 tank destroyer until the end of the war. 93rd Infantry Division Antitank Battalion redesignated on 15 December 1941 at Fort Benning, Georgia. Arrived at Liverpool, England, on 20 January 1944. Landed at Omaha beachhead on 1 July equipped with M10s. Committed to battle in the vicinity of St. Jean de Daye. Advanced to Paris by 25 August and thence to the Siegfried Line in the Schnee Eifel. Fought in the Hürtgen Forest in November, supporting the 28th Infantry Division’s disastrous assault on Schmidt, and remained there when the division was replaced. Held defensive positions in January 1945. Supported 78th Infantry Division capture of the Roer River dams in February 1945, then participated an offensive across the Roer toward the Rhine River. Crossed the Rhine at Remagen on 7 March and supported attack northward to Sieg River and subsequent operations against the Ruhr Pocket in April. Attached to: 2d, 4th, 8th, 28th, 78th, 80th, 90th Infantry divisions; 14th, 102d Cavalry groups. The 94th Antitank Battalion was redesignated the 894th Tank Destroyer Battalion on 15 December 1941. Committed to battle 20 February 1943 at Kasserine Pass in Tunisia. Supported capture of Bizerte. Landed in Italy in late October 1943, located in vicinity of Pignataro in the Migniano sector as of December. Transferred to Anzio beachhead on 25 January 1944, where battalion supported mainly British troops. Entered Rome in June. Crossed Arno River at Pisa in September. Mired at Porretta Terme late 1944–early 1945. Entered Genoa on 27 April. Attached to: 1st Armored Division; 34th, 45th, 85th, and 92d Infantry divisions; 10th Mountain Division; British 1st and 5th Infantry divisions; French Expeditionary Corps; Brazilian Expeditionary Force. The 899th TD Battalion was first deployed with the 9th Infantry Division on June 19, 1944, in Normandy and supported the division through late July. It was originally equipped with the M10 3in. GMC and later with the M36 90mm GMC. 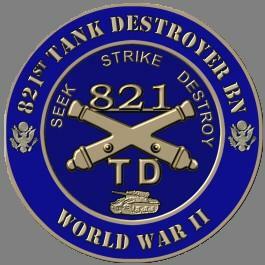 The 99th Antitank Battalion was redesignated the 899th Tank Destroyer Battalion on 15 December 1941. Arrived Casablanca 26 January 1943, where issued new M10s. Deployed to Gafsa-El Guettar sector, Tunisia, on 16 March 1943. Established first American contact with British Eighth Army on 7 April 1943. Arrived Naples area, Italy, on 10 November 1943. Almost immediately shifted to United Kingdom. Liaison personnel accompanied second glider lift of 82d Airborne Division during invasion of Normandy. Battalion proper landed at Utah Beach on D-Day. Helped capture Cherbourg late June. Supported Cobra breakout late July, advance through Mayenne. Entered Belgium 2 September, backed 9th Infantry Division operations in vicinity of Monschau and Hofen, Germany. Fought in Rötgen/Hürtgen Forest region in October. Elements deployed in first days of Battle of the Bulge to stop German advance, others remained in VII Corps area. Supported attack to capture Roer River dams in February 1945. Largely converted to M36s that same month. Crossed Roer River 28 February. Advanced to Rhine near Bad Godesberg, and first elements crossed to Remagen bridgehead on 8 March. Joined attack on Ruhr Pocket in April, then moved east into Harz Mountains. Moved to Mulde River for link-up with Soviet forces, achieved 27 April. Began occupation duty in Bernburg 3 May 1945. Attached to: 82d Airborne Division; 1st Armored Division; 1st, 4th, 9th Infantry divisions.